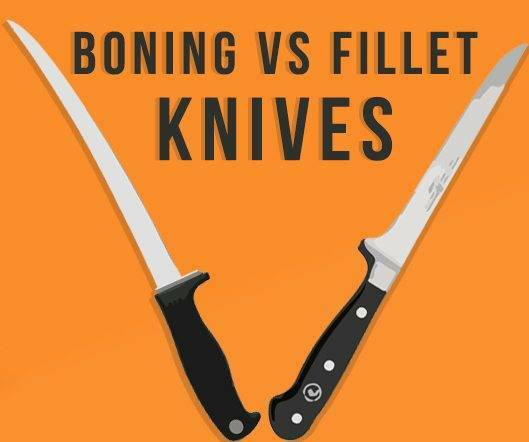 As a non-chef, it’s very confusing to hear the terms “boning” or “fillet” knife. These tools are able to help you cut throw fish and other meats with ease, but they have a very different function. Ideally, you’ll have both a boning and fillet knife in your kitchen, but you need to know how and when to use them. Boning knives are easy to distinguish from other knives in your kitchen because of their shape. (By the way, I keep mine in a different draw simply because I don’t use it as often as a steak knife or a regular cutting knife). Thin and long, a boning knife is meant to be easily maneuvered into the meat to help remove the bone. These knives are often more flexible than the other knives in your kitchen. Looking at the point of the knife, you’ll see that the tip is very sharp. This is meant to help pierce meat with ease. Stiff: Meant for tougher meats. If you plan on boning pork, beef or thicker meats, you’ll need a stiff knife that does not bend easily. Since the meat is thicker, more force is needed during the boning process. A flexible knife will often bend and can cause injury. Flexible: Why would you need a flexible knife? These knives are meant for thinner cuts that are more intricate to bone and easily pierced. If you want to cook up salmon or a chicken dinner, a flexible knife will allow you to remove the bone with ease. Blade lengths are usually 5 – 6 inches, but some manufacturers have extended the length of their knives to over 9 inches in length. Arched blades are becoming more popular and are the ideal choice for boning fish. These blades will allow you to pass through fish just once to remove all of the bone. You use your boning knife to remove bones from meat. The specs of these knives make the whole process easier. Now, let’s discuss what a fillet knife is, so you can better appreciate both types of knives. 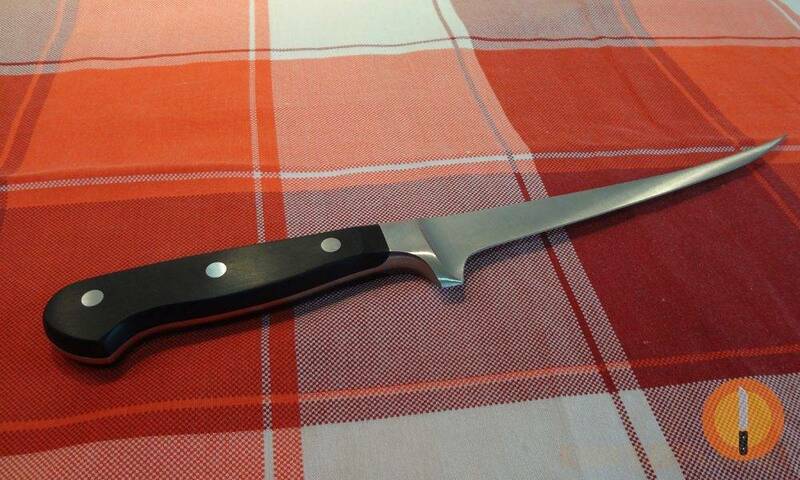 Fillet knives are often synonymous with fish. 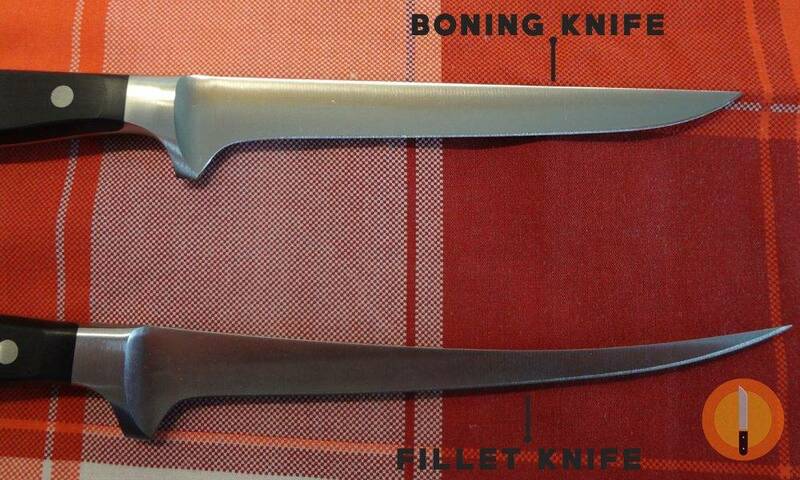 These knives help to remove the bones from fish. While a normal knife can do the job, it is simply not as effective or safe – trust me I’ve tried. Also thin and long. Fillet knives have to be able to remove the bones with ease. As such, you’ll find that these knives are often thinner than their boning counterpart. Fish, as mentioned previously, have skin and meat that is very tender. When removing the bones, a stiff knife will not do the job as well. Extremely sharp blades with a fine point for piercing. I’ve found that a 7.5” works best for me. This is the ideal length for varying size fish and provides the utmost in control. The smaller the blade, the smaller the fish should be. It should also be noted that smaller blades are meant to be more flexible so that precise filleting can be done even on a fish of just a few inches in length. Fillet knives are meant to simply remove the bones of a cut of meat. These knives, often used with fish, are thin and easily lay between the skin and top layer of meat. Some cooks do use their fillet knives to debone meat cuts, but this can make the process harder. The biggest concern is the knife slipping and cutting the user, or the blade becoming damaged if the bone is thicker. It’s important to note that there are electric fillet knives available. If you’re filleting large fish, these knives will save you a lot of time. Each knife has its own benefits and weaknesses. If you’re an avid cook, I highly recommend having at least one good boning and fillet knife on hand: You never know when you’ll need one when preparing your next meal. Read our full guides and decide which knife is right for your needs. I’m a chef, I handle knives daily and know how to use them the right way. I’ve been sharpening knives for almost 15 years, both professionally and as a hobby. I’m also an avid outdoorsman and passionate flyfisher.